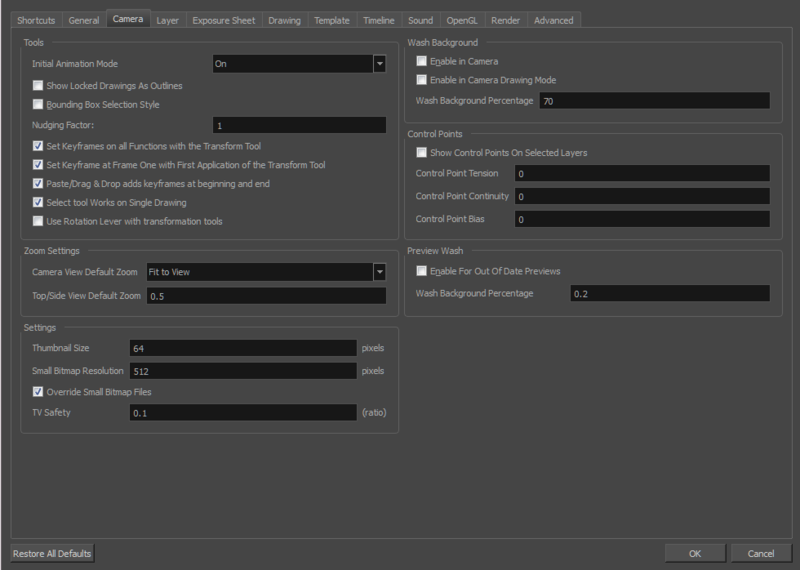 Initial Animation Mode: Determines which animation mode is enabled when the scene is opened. Show Locked Drawings As Outlines: In the Camera view, locked elements are displayed as outlines only. Bounding Box Selection Style: In the Camera view, selected elements are not highlighted in colour but displayed with the bounding box only. Nudging Factor: The nudging increment value. Set Keyframe on All Functions with the Transform Tool: When this option is selected, the Transform tool will create a keyframe for all functions of the selected pegs, including the functions that normally would not be affected by the transformation. Set Keyframe At Frame One With First Application of the Transform Tool: When this option is selected, wherever you set a keyframe on a layer, a keyframe is added on your frame 1. If this options is deselected, a keyframe is only added to the current frame. If later on, you add a keyframe on your frame 1, it may modify the first keyframe you added. Paste/Drag&Drop Adds Keyframes at Beginning and End: Select this option to copy and paste a set of frames that includes an interpolated sequence between two keyframes, but only extracts a partial section. Under normal circumstances, cutting and pasting a function without either the start or end keyframe would render the function null. This option caps the partial function with a new keyframe when you perform the paste. Select Tool Works on Single Drawing: By default, when you draw a selection box in the Camera view, the Select tool will select all the drawing strokes and symbols in its path. If you prefer the Select tool to only select the current drawing and not the other visible drawings, select the Select Tool Works on Single Drawing option. Use Rotation Lever with Transformation Tools: Lets you see the rotation lever when using the transformation tools. When this option is deselected, hovering your cursor over the corner of an element’s bounding box is sufficient to rotate it. Camera View Default Zoom: The default zoom value for the Camera view. Top/Side View Default Zoom: The default zoom value for the Top/Side views. Thumbnail Size: The thumbnail size, in pixels, that appears in the Top and Side views. Small Bitmap Resolution: The size, in pixels, of the smaller bitmap version of your image. When you import a bitmap image into a scene, a smaller version of it is created in order to accelerate the compositing and playback processes. Override Small Bitmap Files: Enable this option if you want the system to generate new versions of the existing smaller bitmap files, every time you modify the Small Bitmap Resolution value. When the option is disabled, the existing smaller bitmap versions will not be regenerated and will keep the same resolution as when they were created. TV Safety: The ratio value for the TV Safety frame in proportion to the regular camera frame. Enable in Camera: Dulls background bitmaps in the Camera view. This allows you to see other elements clearly, such as the ones that have not yet been painted. Enable in Camera Drawing Mode: Dulls background bitmaps in Camera view while using the drawing tools. This allows you to see other elements clearly, such as the ones that have not yet been painted. Wash Background Percentage: The Wash Percentage value. Show Control Points On Selected Layers: By default, when you select an element with the Transform tool, the motion path related to the object is displayed. Control Point Tension: The default Tension value for new keyframes and control points. Control Point Continuity: The default Continuity value for new keyframes and control points. Control Point Bias: The default Bias value for new keyframes and control points. Enable For Out of Date Previews: When you disable the automatic render preview, you need to click on the Update Preview button in the Rendering toolbar or the Camera view bottom toolbar in order to recalculate and update the preview. When this option is enabled, if the current render preview is out of date and requires you to press the Update Preview button, the Camera view will display the current preview as washed out colours. Wash Background Percentage: This is the value, in percentage, by which the outdated preview will be washed out.